Two step quests are usually used for creating quests which give out Silver, making item hunts or giving gifts. Here we will be showing how to set up the quest and how to place a quest like this is a region you upload and also how to make the quest into an item you can upload as a virtual good. Here is a Unity package of an example scene containing quest items. If you do use this example, remember to change the information in the virtual good component, and also remove the quest ID and reserve a new ID. The clickable object is the object the user will click on to receive the gift or silver. You can use any item you want for this. You need to set up this object so it can be clicked on. The clickable object needs a collider on it, and a Box Collider is fine most of the time for this. Click on the object, and then click on Component, Physics and Box Collider if it isn't already on the object. Next thing you need to do is add the Quest NPC script to the object. Make sure you have the object selected, and click on Add Component, then search for Quest NPC and add it. This will add the script to the object. You can check Hide Dialogue for hunts and gift giving quests. Hide Quest Bang can make the quest a little harder as it won't show the quest '!' mark above the quest items. Next thing to do is add the Quest Designer Script to the object. Make sure it is selected, click on Add Component and search for Quest Designer then add it. 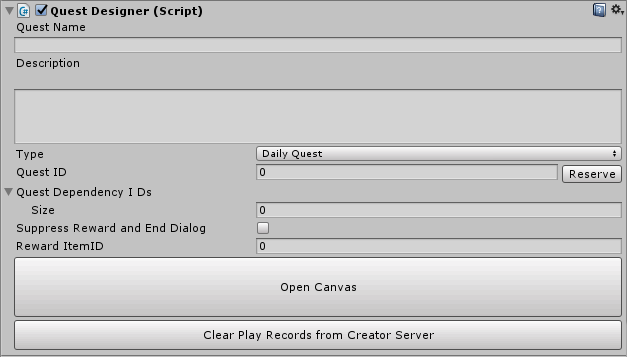 The quest designer script is where you can set the settings for the quest. Quest Name - This is where you will add the name of the quest. Description - This is where a small description of the quest can go. Daily Quest - This is a quest which will be active daily, so users can complete this every day they log in. Main Quest - This is a quest which will only be available once for the user to complete. Side Quest - This is a side quest, which will only be available once. Activity Quest - This is a quest used for activities, such as an in-world game or a hunt quest and can be repeated. Temporary Quest - This is for a quest which will be temporarily available to users. Quest ID - This is the ID of the quest. You need to click on Reserve to get the quest ID. Quest Dependency IDs - You can ignore this for a two step quest. Suppress reward and end dialogue - Again, we don't need this for this type of quest, but this just stops the reward from being granted. Reward ID - This is the important thing to note: The reward ID is where you will enter the ID of the reward item. If you are making a repeatable quest, like an activity quest, leave the reward ID at 0, as this will give the user Silver. It will give Silver again after a cool-down period. Fill in the quest name, description and type. If you want users to be able to get the reward only once, set the type to Main Quest. If you want the quest to be repeated, set it to Activity. Click on the Reserve button next to the Quest ID to get the ID of the quest. Click on the Open Canvas button. This will open the quest canvas, and this is where you will add all the details for the quest. As said above, this is where you actually add the details for the quest. As you can see, it has copied over the information from the Quest Designer. But, you still need to add steps to the quest. Click on the Add Step button, to make the first step in the quest, and then click on the Add Step button again to add the second step. Move the second quest step box over so you can see both boxes. In the first quest step box, copy the name over from the Quest Name box to the Name box. If you need to put a hint, you can, but this is usually used for longer stepped quests. In the second quest step box, name it something like Give Prize, then go back to the first step box, and choose the Next Step to be the Give Prize step. In the second quest step box, check the Supress Nav Line because the user does not need to go to a different location to finish the quest. In both of the step boxes, set the Destination NPC to be the clickable object you made at the beginning. You can do this by dragging the item from the hierarchy to the Destination NPC boxes. Note: Leave the Reward item ID box at 0 if you want the user to get Silver. Leave it blank in both the Quest Designer and Quest Canvas for now if you want to reward the user with an item, as you need to get the ID first. If you are making a quest which only gives users Silver, in the Quest canvas and Quest Designer, leave the Reward Item ID at 0. If you want to give the user an actual item as a reward, you will first need to upload this item. Upload it as you usually would, for example, if it is an item of clothing, upload it using the clothing item settings and the virtual good component. If it is furniture, upload it as a furniture item with the Room Furniture component added to it. If you want it to be spawnable, set it as a Generic upload in the virtual good component. Once the item is uploaded, take note of the item ID. This is the ID you will need to put in the Reward item ID box. 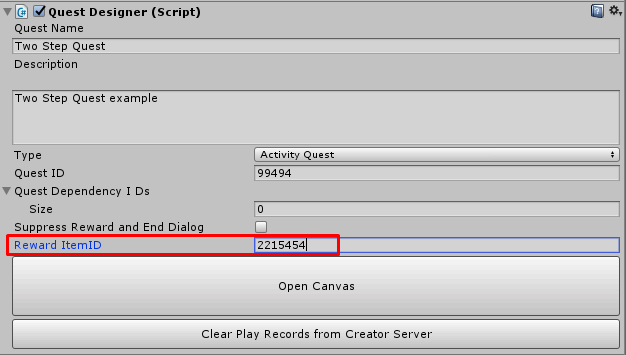 You only need to put the item ID in the Quest Designer, as it will automatically copy it over to the quest canvas. To upload the quest as a virtual good which can be placed anywhere, you need to set it up as a Furniture item. To do this, add the Room Furniture component to the quest object. You can set the placement of the item to be placed on the floor, walls or ceiling. Under collider, you want to drag the Collider of the object into Main Collider. Once this is set up, you can add the Virtual good component. Under basic, set the content type to furniture, then give it a furniture category. Usually Decoration is a good category for this. Fill in the rest of the virtual good, and then upload the item to Sinespace. To upload the quest within a region, you need to only add the Quest Designer component to the quest clickable object. The Quest NPC can then be any other object in the scene. You can upload the region as you normally would, and the quest will be uploaded in the region.